Do you or a family member have a serious medical condition that requires you to take time off from work? Have you been denied rightful Family and Medical Leave Act protected leave or suffered retaliation because you took a leave of absence? Has your employer taken some disciplinary action against you because you have "too many absences?" Whether you are in need of a leave of absence to seek medical care or recover from a serious medical condition, to care for a newborn baby, or care for a chronically ill loved one, you may have a right to take up to twelve (12) weeks of unpaid leave off from work under the Family and Medical Leave Act (FMLA). If you have been discriminated against because you asked for the time off or if you have been wrongfully terminated for taking deserved time off, you may have a legal claim against your employer. We can protect your rights to take a much-needed leave of absence from work without penalty. Our employment law attorneys know how hard it is to face uncertainty and hostility in the workplace while dealing with a serious medical condition. Our firm offers our clients the support, knowledge and communication they need and deserve. We work with our clients to help them make informed choices about the action that they want us to take. We tenaciously, vigorously and knowledgeably pursue our clients' goals. Time Off Without Penalty: FMLA allows up to 12 weeks of unpaid leave annually, either intermittently, in days, weeks or hours, or consecutively. a casual link existed between the protected activity and the adverse employment action. Once an employee establishes a prima facie case, the employer has the burden of offering proof of a nondiscriminatory reason for the adverse employment action. If the employer satisfies that burden, the employee will then have prove that 'but for' the discriminatory purpose he or she would not have been terminated. The FMLA makes it unlawful for an employer to interfere with, restrain or deny the exercise of or the attempt to exercise any right or benefit provided by the FMLA. 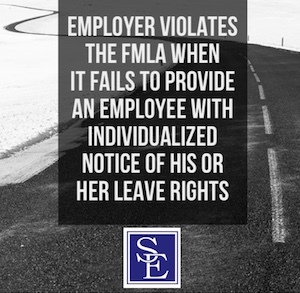 An employer’s interference with the exercise of an employee’s rights under the FMLA includes not only refusing to authorize FMLA leave, but discouraging an employee from using such leave and manipulation by a covered employer to avoid responsibilities under the FMLA. In order to prove a case under the FMLA interference, the employee must show that he or she was entitled to benefits under the FMLA and that he or she was denied them. The employee does not need to show that the employer treated other employees more or less favorably and the employer cannot justify its actions by showing that it did not intend it or it had a legitimate business reason for it. A FMLA claim for entitlement or interference is not about discrimination, but instead, whether the employer provided its employees the entitlements guaranteed by the FMLA. To learn more about how an experienced New Jersey FMLA lawyer at Smith Eibeler can help you, please contact us to schedule a consultation with one of our experienced employment attorneys.